Fig. 5. Water spilling over the Avalon dam. The mill's design was similar to The Mayo Mills, though there were a few improvements over the first mill. The dam on the river at Avalon was constructed of granite instead of wood. From the dam, a canal or millrace was dug alongside the river which spanned a distance of about 1950 feet.7 The canal terminated at a stone flume at the front of the mill. The flume served to funnel water into the headrace which flowed under the mill. Grating was installed at the entrance of the flume to prevent large debris such as tree branches from entering the mill's headrace. At the dam end of the canal, there were gates to regulate the volume of water entering the canal. There were other gates which allowed for the release of water back into the river bed. As a testament to the craftsmanship of the dam, it still stands today along with the flume and canal. 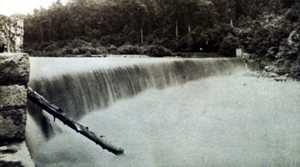 The dam has managed to hold back the waters of the Mayo River for a hundred and fifteen years. Fig. 6. Ad for S. Morgan Smith, McCormick turbines. 1904. Water flowing through the headrace beneath the mill rushed over two S. Morgan Smith turbines2 placed in a pit in the mill's engine room located on the back side of the mill. The engine room also served as the mill's machine shop. In Fig. 7 below and in other sources the engine room is dubbed as the machine shop. The flow of water set the turbines in rotational motion generating the energy required to power machinery in the mill. Once the water left the turbines it flowed out through the tailrace and back into the river bed. Sources disagree as to the size and output power of the turbines at Avalon. However, a source pertaining to The Mayodan Mill stated that it had two thirty inch McCormick turbines on a horizontal shaft capable of developing eight hundred and forty-six horsepower and an additional twenty inch, one-hundred horsepower turbine was in place driving an electric electric generator to power electric lighting and the fire pump.7 Other sources suggest and it is probable that the turbines in the Avalon mill were larger as future expansions were in the minds of its designers. Whatever size turbines they were, the overall setup for both mills was similar if not identical. Fig. 7. The Avalon Mills cut from a 1900 fire insurance map. Image has been relabeled for legibility and has the river and railroad added to give an idea of the general layout. Click here for larger version. The main building was of typical cotton mill construction for the period. The building stood four stories high spanning a length of one hundred and eighty-five feet and one hundred and four feet wide. The front and rear walls were brick while the end walls were wood to facilitate expansion. There was a detached boiler room with a wood-fired boiler that circulated steam through overhead pipes throughout the mill for heat during winter months. Rotational energy from the engine room was transferred to each floor of the mill by a series of ropes and pulleys which ran up a beltway through the mill. The ropes drove line shafts running overhead on each of the mill's floors. The line shafts rotated around 300 revolutions per minute2 and were connected to machinery via leather belting. There was a main disconnect switch — a transmission if you will — to engage/disengage the turbines from the line shafts. The tower on the front side of the mill housed the stairways extending to each floor. In the top of the same tower, extending above the mill was a nine-thousand gallon water tank which was part of the mill's fire protection system. Fire was a major concern in cotton mills. Airborne cotton dust and lint would accumulate on machinery, the floor, overhead piping, and even cling to walls. Due to the nature of the equipment and manufacturing processes almost everything in the production areas would end up coated with a film of machine oil. The oil helped the cotton dust stick and stay put. Cotton dust is flammable and easily ignited. Friction from a slipping belt could generate enough heat to cause ignition. If a fire were to start, the beltway which was open from the top floor all the way down to the engine room offered a convenient path for fire to spread throughout the mill. It did not help matters that the floors were made of wood. The wood served as a nice sponge for oil. 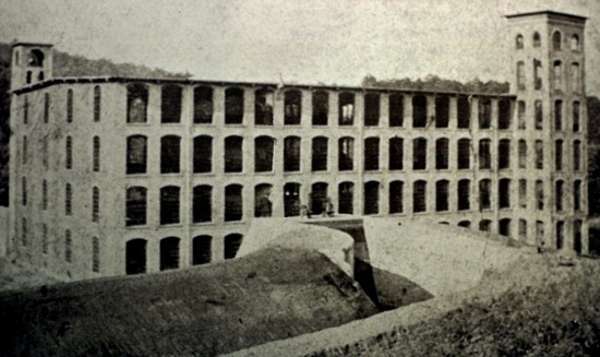 Designers of the Avalon Mill understood the hazards and spent efforts to protect the mill from fire. The water tank in the tower was connected to a series of piping throughout the ceilings on each floor. Grinnell Glass Disk fire sprinklers were installed at regular intervals in the piping.2 Gravity acting upon the water in the tank maintained constant pressure on the sprinkler heads making them armed and ready to quench fires before they spread. The tank was fed from a fire pump located outside the engine room which could pump water from the mill's tailrace at the rate of a thousand gallons per minute. Fire pails, otherwise known as buckets of water, were hung from poles throughout the mill for use on small fires. Outside, underground piping lead to hydrants placed in strategic locations around the mill. A night watchman was employed to keep a close eye on things while the mill was shut down. The watchman patrolled the mill at scheduled times. An Imhauser watch ensured the watchman wouldn't be sleeping on the job. The watch recorded the times and locations he patrolled at various key stations throughout the mill. It was claimed that when the Avalon mill was built it had one of the best fire protection systems in the South.2 Regardless of such claims, having the best fire protection system is no guarantee that it will work when needed. Fig. 8. Ad for the Mayo and Avalon Mills. 1910. 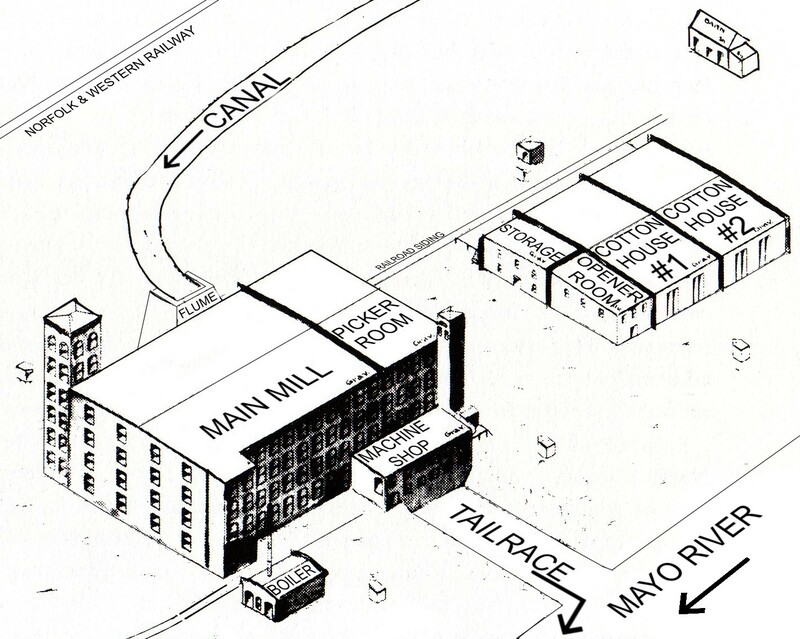 The Avalon Mills went into operation with about forty employees operating 13,0009 mule spindles. Cotton was spun into size 8 to 30 combed yarns. The yarn was wound onto cones to be sold to manufacturers of underwear and hosiery.9 Some of the machinery in the mill included Universal Cone Winders and combers.2 In December of 1900 an American Moistening system of humidifiers was on order to be installed in the mill.11 Maintaining a certain level of humidity in spinning rooms was important for a consistent product. Fig. 9. The completed Avalon Mills. The canal/millrace is visible in the foreground leading into the flume. The canal had not yet been flooded with water. 1. "Southern Mill Notes," Fibre and Fabric: A Record of American Textile Industries in the Cotton and Woolen Trade, July 15, 1899. 2. Foushee, Ola Maie, Avalon: A North Carolina Town of Joy and Tragedy (Chapel Hill, NC: Books, 1977), 11-13. 5. "Mayodan," The Wachovia Moravian (Salem, NC) September 1899. 6. "Mayodan," The Wachovia Moravian (Salem, NC) September 1899. 7. Swain, Geo. F., Holmes, J. A., and Myers, E. W. North Carolina Geological Survey: Papers on the Waterpower in North Carolina, Bulletin No. 8 (Raleigh: Guy V. Barnes, 1899), 111. 8. "Electric Light and Power," Electrical World and Engineer (New York) October 13, 1900. 9. "Mayodan," The Blue Book Textile Directory of the United States and Canada, Fourteenth Annual Edition 1901-1902 (New York: Davidson, 1902), 140. 10. Fibre and Fabric: A Record of American Textile Industries in the Cotton and Woolen Trade (Boston) December 1, 1900. Fig 5 - Unknown, Avalon Dam (1899-1912), Location, Avalon, NC, Image [from Avalon: A North Carolina Town of Joy and Tragedy (Chapel Hill, NC: Books, 1977), 17]. Fig 6 - Unknown, Pair McCormick Turbines, Advertisement [from Textile World Record: Volume XXVII (Boston: Lord & Nagle, 1904), 255]. Fig 7 - Hardendorff, A. L., The Avalon Mills: Fire Insurance Map (1900), Drawing: modified by author [from Avalon: A North Carolina Town of Joy and Tragedy (Chapel Hill, NC: Books, 1977), 14]. 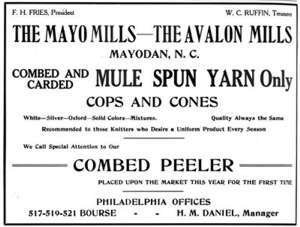 Fig 8 - Unknown, The Mayo Mills - The Avalon Mills, Advertisement [from American Wool and Cotton Reporter, (Boston) March 31, 1910, 14]. Fig 9 - Unknown, The Avalon Mills (1900), Location, Avalon, NC, Image: modified by author [from Avalon: A North Carolina Town of Joy and Tragedy (Chapel Hill, NC: Books, 1977), 10].